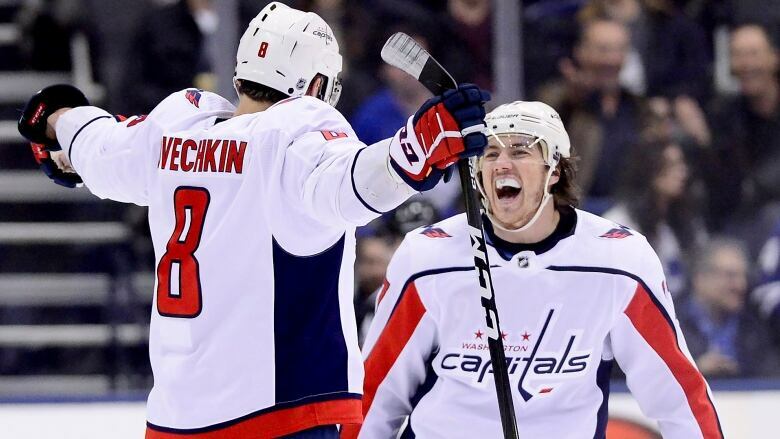 Alex Ovechkin scored the 650th goal of his career and Braden Holtby made 40 saves as the Washington Capitals defeated the Toronto Maple Leafs 3-2 on Thursday night. Tom Wilson, with a goal and an assist, and Brett Connolly also scored for Washington (34-20-7), which won consecutive games for the first time in two weeks. Lars Eller added two assists. Andreas Johnsson and John Tavares replied for Toronto (36-20-4). Frederik Andersen made 25 stops. The Leafs, who were playing at home for the first time since Feb. 6 following a season-long six-game road trip that ended with a 3-2-1 record, entered 7-2-2 over their last 11, but had also dropped two straight. Washington, which donated a Stanley Cup ring in honour of last June's victory to the Hockey Hall of Fame on Wednesday, grabbed a 1-0 lead at 3:54 of the second period when Ovechkin fired another milestone past Andersen with Toronto defenceman Morgan Rielly in the penalty box for holding. "His numbers, his play speak for itself," Tavares said. "You look where he scored from tonight — that's not that close to the net. His ability to get pucks off (with) very little room and being as accurate as he is ... there's no bigger threat over the last 10, 20 years on the power play. Ovechkin — who has 39 goals in 48 career outings against the Leafs, including 22 in 24 games in Toronto — beat Andersen on Jan. 23 for the 1,179th point of his career to tie Sergei Fedorov for the most points in the NHL by a Russian-born player. Ovechkin currently sits at 1,192 career points. Washington then went up 2-0 at 12:07 on a sequence that started when Wilson rocked Leafs blue-liner Jake Gardiner behind the net. Eller grabbed the puck and found Connolly, who outwaited Andersen to slide home his 15th. Carlson had a chance to make it 3-0 later in the period, but Andersen made a terrific stop on the defenceman's blast. Holtby made a couple of good stops early in the third, but the Leafs finally broke through at 4:23 when Johnsson roofed his 16th after Auston Matthews had his wraparound effort stopped. Toronto got a power play when Carlson was whistled for hooking, but Washington restored its two-goal lead when Wilson buried his 16th off a pass from Eller on a 2-on-1 at 6:46. Wilson celebrated in his hometown by delivering a fake high-five to the crowd along the glass. Mitch Marner had an opportunity to get Toronto back within one with six minutes left in regulation, but chose a pass that just failed to connect to Zach Hyman instead of shooting. 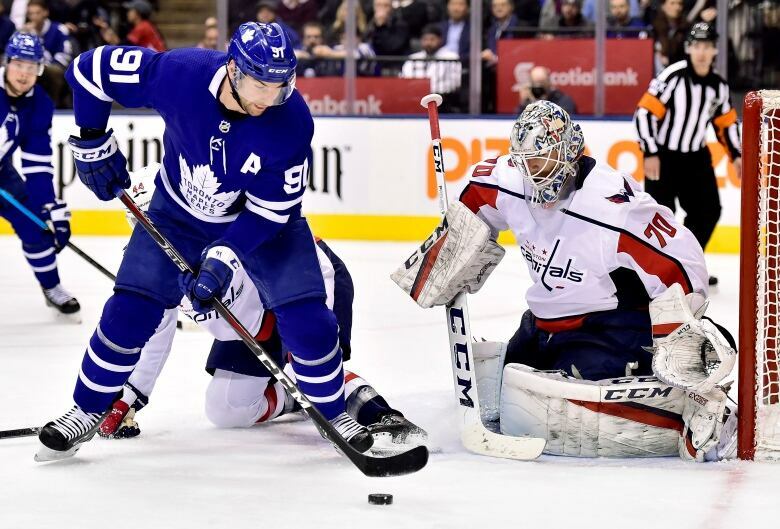 Tavares scored his 34th with 32.1 seconds left with Andersen on the bench for the extra attacker, but that's as close as the Leafs would come as the Capitals held on to win consecutive games for the first time since Feb. 5 and 7 against Vancouver and Colorado. Holtby then stoned William Nylander, who moved to centre from the wing with Nazem Kadri out with a concussion, and Connor Brown in quick succession. Not to be outdone, Andersen flashed the leather on a Dmitri Orlov blast off an ugly turnover by the Leafs in their own end.